Rather than using over-refined standard white sugar, add the finishing touch to your desserts and hot drinks with Sugar In The Raw! Made from turbinado sugar cane grown in the tropics, this sugar will please your patrons with a preference for all-natural products. It's also naturally gluten free. Since this raw sugar is unrefined and unbleached, the larger-sized crystals retain an unmistakable, natural golden brown color. Best of all, you can simply substitute 1 teaspoon of Sugar In The Raw for 1 teaspoon of standard sugar! We purchased sugar in the raw packets for our coffee shop. This is one of my personal favorite sweeteners. This packers are convenient and the customers can grab and go. Recommend this product to any for both residential and commercial purpose. Sugar in the Raw individual packets are a great addition to our coffee shop "fix in's" station. The light molasses taste, and larger crystal size of the Sugar In The Raw is a favorite among our patrons. These are the real deal and for an unbeatable price! Every packet is dry and moisture free. Delivery is fast and punctual as usual. Our customers love it and so do we! I priced theses at Costco and Restaurant Deport and Webstaurantstore is definitely he best affordable place to get these. I will order 2 boxes next time. Sugar in the raw is my personal favorite sweetener. I feel like it is gives it a different kind of sweetness that I like. I recommend using it in hot beverages since it doesn't dissolve in cold drinks well. Product is great for anyone not currently using them. They are the most requested packet at our coffee shop. Box is conveniently sized and it's a quality product. If you're a coffee shop, tea shop, bakery with beverages, this is a must stock item in your establishment. Perfect for customers to take with their to-go coffees if they don't have time to fix them up in shop! These sugar packets were a quarter of the cost from my local food distributor. They are good quality. Product was not damaged during shipping. Shipping was quick. I recommend buying from webstaurant. What you see is what you'll get. This is a good product and definitely something that our customers expect us to have. My only complaint is the size of the packet, which is bigger than the other sugar and sugar substitutes, but that's just the nature of the product itself. Sugar in the Raw is the best sweetener. It takes a little extra time to stir it in to your drink but well worth it. The best things in life are earned. This is an excellent product. My customers really like it and a box lasts him about 4 months. Honestly this is an excellent price for this product. Perfect for our shop, came as expected in a small box. No sugars were open. Packets weren’t cheesy and were durable. Clients like these sugars. We will order again. Our customers go crazy for these. Definitely a product we buy name brand as the "in the raw" line carries a lot of great brand recognition. Webstaurant store's sugar in the raw packets 1200 per case 5 gram packets is the exact product i was looking for at a great price. The sugar in the raw is amazing and makes an awesome sweetener for our coffee. The sugar is so tasty an very high in quality. Industry standard and good quality liked by all. We have been purchasing this for a long time and will continue to do so in the future. Our customers favorite sugar and we supply it to them! The box has plenty and lasts us for a good while before the next order is needed. This is one of those products that people look for the name brand. While I'm able to get by with nameless sugar substitutes this is a product people want the name they k oz, trust, and love. No problems with shipping or packaging. Another great buy from webstaurant. We love Sugar in the Raw! They have big granules and these come in nice 5 gram packets. The packets are easy to tear open and fit perfectly in our coffee condiment setup with the other sugar packets. Our customers love these Sugar in the Raw packets. They can easily grab them to go or use them to fix their coffee in the shop. Overall, we are pleased with the way they sweeten our coffee. 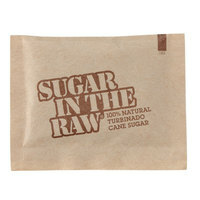 We absolutely love purchasing these Sugar in the Raw packets from Webstaurantstore.com... They are certainly cheaper than anywhere else (even with shipping) and it is exactly the same packets!! Awesome find. I have been looking for a natural sugar sweetner but never really had any luck until i foudn this sugar in the raw. I absolutely love it!!! this is a great product that we had been buying from one of our wholesalers, and paying much more for. we will definitely continue to order from webstaurant store instead! Very nice quality sugar packets. None of the packets were broken or open, and my customers really enjoyed the taste of the sugar. Thanks for the quality product. Our coffee to go station uses these sugar packets for people to grab and take with them. They are convenient and priced just right for daily consumption. This is my go to sugar in general, have used it for years. I definitely prefer a less processed raw sugar option when considering sweeteners. This is a great pack of sugar to have for customers on the go. High end customers love the cane sugar in their espresso and latte. My customers like having sugar options and this fit the bill perfectly. no complaints of clumping from my customers. sugar in the raw is a great brand. The sugar in the raw is a pure, all natural style sugar that is so more flavorful than refined white sugar. You can definitely tell a difference in tastes and our coffee shop goers love the sugar in the raw. Sugar in the Raw is a great sugar option for us at our Vegan coffee parlor. We love the single-serve packets, and the price is great for the bulk quantity! If you are running a coffee or tea shop, this stuff is a must have! You are always going to have customers that ask for this instead of the artificial sweeteners. Sugar in the Raw is a great all natural type sugar that has not been refined. It is great for sweetening our hot tea and the packets are lovely. We are a tea shop and our customers always ask for raw sugar. I like providing the "name brand" Sugar in the Raw, and this is a good price, even with shipping. No problems here! Wow this is a popular product. People love it in their coffee and teas at our cafe. I totally recommend it if you have a cafe! Great packaging and it arrived very quickly! I love sugar in the raw, and wanted it for our restaurant but not the mess of having loose. Webstaurant sells these sugar in the raw packets for a reasonable price for the quantity they come in. This is a great sweetener but does take a while to dissolve. While I love this brand, about 2% of the box is empty packets. Other than this, I cannot complain. People love Sugar in the Raw brand sugar, and we love it too! Handy little raw sugar packet. A more natural version than white sugar. These come 1200 in a case making them a great value. Highly recommend this product. The sugar in the raw packets are great for single serve coffees and looks great on your coffee stations. The guests love tis brand of sugar. I absolutely love raw sugar. Not only in drinks, but I enjoy baking with it too. Rolling cookies in this sugar before they are baked gives them the best crunch. Sugar In The Raw 5 Gram Packets - 1200/Case #110835 This is conveniently packaged, always a customer favorite. Reorder often. Very happy with the product. These packets are great for coffee service. They are our most popular sweetener that we present to the guests. Price is reasonable for the quantity. My customers love these packets for their organic coffees. They are really affordably priced and come in a great bulk package. Shipping was quick and can't wait to order these again. I love using raw sugar to roll our molasses cookies in. It has the best flavor. It's more caramel-y than regular granulated white. These packets taste awesome in coffee and that's why we buy them. These packets are great for offering sugar. I don't have to fuss with a dispenser and they are always clean. They arrived in good condition and no rips or creases to speak of. Every time I put them out it looks fresh from the factory. I love these sugar in the raw packets. I love the individual serving size and the flavor of this sugar. It tastes great in coffee. We use these sugar packets in our cafe. 5 grams packets work great for our customers. I wish it was organic sugar, however, it's better than some other highly refined white sugars. An excellent sweetener option for those looking for a more organic choice. We have looked for raw sugar from a few other vendors, but Webstraunt's prices are unbeatable! These are good. Raw sugar reminds me of brown sugar. I like putting it atop of something rather than in something. It can still be used with beverages atop the whipped cream or such. The packets are convenient to carry because not all rvendors offer these as an option. Our customers requested that we steer clear or artificial sweeteners, so we ordered some sugar in the raw. The packets are great for a coffee shop - the only concern I had was that some of the packets had broken during shipping and caused a bit of a mess in the box. But overall I am very satisfied with this product! More expensive but it's the most popular sugar for customers. They seem to really enjoy the raw sugar over the regular processed sugars. Love it. Awesome taste, quality, and price! our coffee house customers love this product for coffee and for lattes. We are always happy to purchase bulk sugar packets from Webstraurant! Sugar in The Raw is my preferred brand for natural sugars. It is a great product and my customers respond well to having it as an option. The packaging is a great and it is recognizable as a natural and good tasting sugar. Sugar in the Raw! Our guests love this product. It is more expensive than traditional and artificial sweeteners, but well worth it. This is the best price on the internet! Great product! I love the flavor of this raw sugar. It looks nice in the brown packaging and the texture is thicker than regular sugar. Great product! It took us a while to finish the whole box but it was perfect size and good size box for storage! Fast shipping! We offer these packets in our coffee shop for a higher end sugar option. Customers love the option. Great price and quantity. always ships quickly and damage free. Much cheaper and higher quantity than buying irate sugar n grocery store for our business. Name brand that our customers recognize and appreciate. Will order again. Sugar in the Raw is a must have in a coffee shop. Great for all of our hot beverages. One of my favorite sugars! Highly recommended! Sugar in the raw comes in convenient packets for tea, coffee and oatmeal. It is less refined cane sugar that is not too sweet. It doesn't taste bitter like the fake sugars. This is the best place to purchase Sugar in the Raw! I've looked all over and webstaurantstore.com has the most bang for your buck! Thank you! Sugar in the raw is a classic that people demand to see int he store. Great price here, and has that non-mo sticker on it! Great sugar. easy to restock. very good quality. i have no issue with this product. I will definitely purchase this item again. Hope these item has more information on package. Sugar in the raw is a great product! We use it all the time in our coffee shop. It dissolves well into coffee and customers like having a raw sugar option. This is our favorite sugar product and our customers love it too, so it makes perfect sense to order it in bulk at a great price! We LOVE LOVE LOVE sugar in the raw. This sugar tastes awesome with it's natural cane sugar and caramel flavor adds a rich consistency to a nice cup of black coffee or tea, also the packaging looks very professional in our coffee bar. This product is a great quality turbinado sugar that I use for almost all my sweetening needs. From baking to sweetening my coffee, it does the job and tastes great. It is also a healthier way to sweeten as well as presents great portion control in these packets. Our package of Sugar in the Raw showed up quickly and was in great condition. We are very happy with this quantity and the quality of the packaging that it arrived in. Happy Customers! Sugar in the Raw is very trendy right now b/c it doesn't contain unnatural bleaches. We find that it is chosen more often than substitutes and regular sugar. These packets are great for customers on the go. They seem to love the more natural option to use in their hot beverage of choice. Can't beat the price on these Sugar In The Raw packets. Webstaurantstore always delivers on great value. Our customer's love these raw sugar packets as an alternate to other sugars. We were purchasing the "store brand" from another provider, and found that this name brand raw sugar cost less and tastes better than the store brand. Great value! These sugar in the raw packets are delicious, easy to open, and are attractively packaged. Most of my customers have switched from white granulated sugar to raw sugar. Sugar in the raw is the best option for adding to coffee, especially iced coffee. It adds a great flavor to the coffee and other drinks. I highly recommend this to anyone who sells or serves coffee to a number of people. Sugar in the Raw is my "go to" turbinado sugar -- beautiful coarse crystals that are perfect for topping desserts or when making a sweet bread, I sprinkle Sugar in the Raw on top after the egg wash and you'll get this wonderful syrupy texture on the crust of the bread once baked. Highly recommended for easy dispensing as each packet contains a good sized serving. We purchase both sugar in the raw and stevia in the raw for our coffee shop. Our customers really like the convenience of the pre-packaged sweeteners versus using a bulk option. We got a lot of customer requests wanting raw sugar available at our coffee station. Webstaurant has the best price I've been able to find! We're very pleased, and our customers are happy too! This is great for our coffee shop. I haven't found a better price and easier delivery option. I'd highly recommend this product to anyone looking for high quality sugar at a good price. Just wish they sold it in bulk too! My family loves the taste of sugar in the raw. I appreciate the unrefined quality of the sugar and it's more full taste as compared to white sugar. Nice to be able to buy packets in bulk here. This is a great product at a great price and value. This is an excellent way to offer a healthy alternative to white sugar packets for your guests. Thank you for your ease of on line shopping, quick delivery and competitive pricing, these packets are just what I was looking for for our new coffee business. we operate a coffee ,bagel,smoothie,ice cream shop, the raw sugar option in the small portion makes a very nice addition to the condiment serving area. We have a lot of customers who prefer sugar in the raw and having the packets to offer them makes them very happy. There a great price for the quantity. I like using this product for all my sugar needs. The fact that it is raw sugar is a super plus in my book, considering that white sugar is bleached and all the nutrition is sucked out. At least with this sugar it has other minerals in it. Tastes good in my afternoon tea. This product has a great flavor and is very popular. Good price for the amount that you get as well. Nice crunchy granules in the bottom of your cup, great with iced tea and coffee. My customers love sugar in the raw. They don't like chemicals in their sugar so this is pure sugar. It's a great price compared to buying in the grocery store. Sugar In The Raw is delicious! The portions are great and the price is fantastic! Great product great price, I'll be sure to purchase again. Yum! Sugar in the Raw is my favorite thing to add to coffee. It is also great to sprinkle on top of cappuccinos to add sweetness and a nice crunch. These little packets are a hit! Great tasting and much better than putting a shaker of sugar on the table in my experience!! Worth every penny! I love sugar in the raw. While it is a little harder to dissolve into your beverages I don't ever have to worry about strange health risks. When running a coffee shop, keeping packets like these around is a must. They are widely recognized and everyone has their favorite. The price on here is competitive too! These are nice packets to have now a days! The newest trend is all about organic and healthy foods, with these sugar in the raw packets youre sure to offer a better product!! sugar in the raw is great. Its all i use in my coffee. the regular white refined sugar always gives me a headache. I hate that junk. Its nice to offer your customers the choice. People has different preference on how to make coffee sweet, and brown sugar is one of them, unfortunately, it is very sticky and hard to clean, Good thin they have it in 5 gram packets. We have the basket sugar packet setup on our tables, the pink, the blue, the white, and the yellow. Then I decided to try this over the conventional white packets, honestly this was cheaper, and now these are used more than anything else. Great product, great price. This was a great find for us. We were always having to monitor and refill the sugar bowl, then be concerned about humidity when guests wanted it; the packets are always at the ready and fresh. I love raw sugar and this is the best price I've seen anywhere. It's a nice option for coffee. This shipped very quickly. Completely satisfied. We've never found a better price for sugar in the raw. And you guys ALWAYS have it in stock. Everywhere else I go I have to wait a week! This is the best price I found on the web! These individual packets are a great sugar substitution for those looking for a more natural sugar product. Much more convenient then having a shaker filled with raw sugar. These packs keep the product dry so there is less clumping involved with pouring.